The Bristol Tennessee City Hall is located at 801 Anderson Street, Bristol, TN 37620; phone: 423-764-4171. Photo: Bristol Virginia-Tennessee Slogan Sign, ca. 1910, East State Street, Bristol, Tennessee and Virginia. Listed on the National Register of Historic Places in 1988. Photographed by User:Aplomado (own work), 2006, [cc-by-3.0 (creativecommons.org/licenses/by/3.0)], via Wikimedia Commons, accessed February, 2013. The City of Bristol, Tennessee-Virginia began as the dream of a merchant from nearby Blountville, Tennessee. This merchant, a young man named Joseph R. Anderson purchased 100 acres of land from his father-in-law, Rev. James A. King. Anderson believed that this land, which straddled the boundary between Virginia and Tennessee, was ideally situated for growth of a town. Shortly after purchasing the property in 1852, he had the town planned and surveyed. He distributed maps and began offering lots for sale. Believing, or hoping, that his town would become an industrial center, he named it for a city in England that was known at that time for developing new industries and commerce — Bristol. One of the reasons for Anderson's optimism concerning growth of his town was the fact that it was on the proposed route of the railroad that would connect Richmond, Virginia with Knoxville and Chattanooga in Tennessee and Atlanta, Georgia. As he predicted, the railroad did play an important part in the growth and development of Bristol and Northeast Tennessee. Anderson, however, was not the only person who could see the potential for a town located at the point at which the railroad would cross the state line between Virginia and Tennessee. At about the same time, or immediately afterward, Col. Samuel Goodson, cousin of Rev. James A. King, platted a town on land he owned immediately to the north of Anderson's Bristol. He called his development Goodsonville. Like Anderson, he anticipated growth and proceeded to construct rental property. In 1856, the Town of Goodson, Virginia was incorporated to include all of Goodsonville, plus that portion of Bristol on the Virginia side of the state line. At that point, these "twin cities" were Bristol, Tennessee and Goodson, Virginia. That same year, the railroad came into town, and the already rapid growth accelerated. 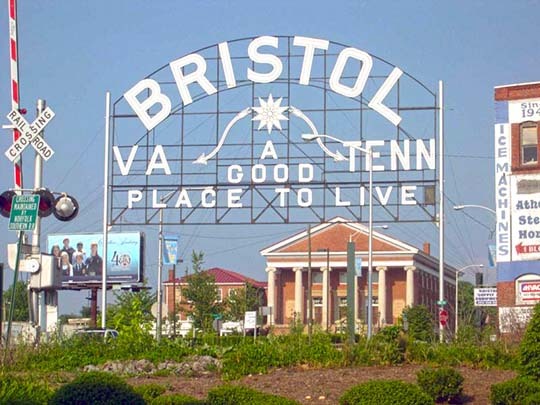 Although it was officially called Goodson, the city north of the state line continued to be known unofficially as Bristol. By 1890, the unofficial was made official, and Goodson, Virginia became Bristol, Virginia. The border cities shared their name. To this day, the thriving downtown areas of both Bristol, Virginia and Bristol, Tennessee are joined together along State Street. Running east and west, much of State Street is also the state line. Also shared by the two states on East State Street is the Bristol Virginia-Tennessee Slogan Sign. Gray Stothart, First Tennessee Development District, Holston Avenue Neighborhood Historic District, Sullivan County, TN, nomination document, 2012, National Park Service, National Register of Historic Places, Washington, D.C.